Recently, I spoke to a group of marketing executives about customer experience management (CEM). After going through definitions, fundamentals and pitfalls, we started talking about what CEM really, practically means to the marketer. To make a critical point, I asked the group, "When was the last time your marketing plan looked like this:"
I talked about segmentation and customer persona development and how good strategies align customer segments with quantifiable goals and metrics. We touched upon the subject of customer experience mapping, which establishes and aligns multiple marketing campaigns to ensure customers don't "fall through the cracks" at any point in the journey to brand discovery. We talked about the importance of requirements documentation, project planning and business process alignment in campaign planning and execution. As we reviewed the planning process, we also addressed the importance of periodic reality-checks that ensure the segments, goals and metrics originally created align with the campaigns that are actually being developed. There were a lot of gaping stares and the discussion triggered many desperate attempts to get copies of my slides. The group's response was extremely telling, reinforcing my assertion that many marketers are today, very desperate for tools that will allow them to better create and manage customer experience today. Today's marketing just isn't the same as it was in the hay day of your grandmother. Heck, it 'aint your momma's marketing, either. Today, the whole face of marketing has changed, and if your organization hasn't adjusted its tack significantly, you should be concerned. Today's leading companies recognize, support and develop the role of marketing in rallying the organization around a central vision for customer experience. Marketers today must know how to successfully interface and coordinate the activities of a broad spectrum of players, from typical agencies and service partners through to a multitude of internal players including product development, customer service and technology. These companies recognize that marketing's ability to be successful in this role is dependent on crediblity. Marketing credibility is dependent on skills and proficiency, organization and clearly defined process. It's also critically dependent on marketing's ability to understand the needs, pressures and priorities of internal departments. Supporting the marketing department positioned to do this requires very strong top-down coordination and leadership - that doesn't just come from the CMO or VP of Marketing level. Organizational alignment in the executive ranks must be created by C-level leadership. Now, the management dynamics required to make this happen are certainly complex. 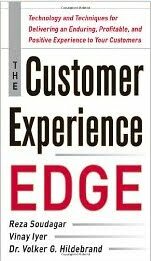 In fact, in most organizations, customer centricity is damaged by leaders that fail to coordinate departmental activity in a synergistic way. As a result, departments be come so silo-driven and task focused that the organization misses key collaborative goals for the business. And this shows to investors in the end. I won't get too focused on the types of documents reflected above, because focusing too much on TASKS can take your eyes off of what's MOST important. If I had a dime for every client claiming they wanted to be customer centric, I'd be a rich woman. The reality is, all the planning referenced above has got to be created based on a clearly articulated vision of what prospects and customers need and want. The organization has to be rallied around - and measured against - the delivery of this vision. We'll talk more later about some tools that can help with CEM creation and management... stay tuned. I spoke on the subject of Customer Experience Management at the annual Marketing Profs retreat a few weeks ago. We talked alot about the concept I've been promoting for a few years called the "three word rule" and went through a list of brands that really understand the rule and how to apply it. Later on, the subject of Volvo came up, and unilaterally the one word that came up was "safety." Now, that's brand equity. Volkswagen is now getting into the safety game with its "Safe Happens" campaign - and they're doing it with highly compelling advertising approach. Created by ad agency, Crispin & Porter, the ads feature every day people - much like yourself - experiencing car accidents. If you're paying attention, the ads drag you right into the accident in a participant's capacity.... and you'll vicariously experience the accident with the actors in the commercial. You'll also join in their relief that no one is hurt. It's very effective. View a few of the ads by clicking here or here. What Crispin and Porter are playing off of is the power of the vicarious experience. For example, we all know gossip and bad news are viral. What's important to remember is that customers that have a bad experience with your brand may enable others to vicariously experience the event through word-of-mouth. I recently had a talk with a friend who likened waiting for help at the Apple Store to "waiting to be noticed by the cool kids in school." While she didn't like the experience much, she admitted she could not help but notice her desire to "be one of them." Cool by association, courtesy of the vicarious experience dynamic. Vicarious experiences invite others to participate and engage the senses and the emotions. They motivate people to change, react, consider in a more tangible way. There's something to be learned for all of us in these examples.